Often regarded as the finest of all apples, Cox's Orange Pippin sets the benchmark for flavour to which all others aspire. The aromatic complexity and depth of flavours are remarkable. In our personal experience pear, melon, freshly-squeezed orange juice, and mango are all readily evident in a good example. Cox's Orange Pippin is a mid/late season variety, at its best if picked when fully ripe, or picked slightly under-ripe and left in storage for a month or so - it is not a long-keeper though. Although primarily considered a variety for eating fresh, Cox is an excellent apple for juice / cider blends as well. It is also a versatile culinary apple, with an inherently sweet flavour when baked, and is a common ingredient in English apple preserves, chutneys, and mincemeat. Please fill in the details below and we will let you know when Cox's Orange Pippin apple trees are back in stock. An excellent substitute for Cox's Orange Pippin, much easier to grow. A sweeter flavour than Cox, easier to grow, and with a wider climate range. A Cox-style russet - Cox's Orange Pippin is one of its parents. A Cox-style apple with perhaps the best sweet/sharp balance of any apple. One of the best alternatives to Cox's Orange Pippin, with a good sweet-tangy Cox-like flavour. If you are looking for excellent flavour then Bright Future is worth considering. Some of our Cox selections are not self-fertile - please check with us if you need more details.? Cold hardiness: -20F / -29C? Cox's Orange Pippin is in flowering group 3. Cox's Orange Pippin is self-fertile and does not need a pollination partner, although fruiting may be improved if there is a compatible tree of a different variety nearby. Since it flowers in the middle of the blossom season it can be pollinated by most other apple trees. Cox's Orange Pippin generally performs better in the drier parts of the UK - the South-east, East Midlands, East Yorkshire and as far north as Edinburgh. It has a reputation for being a bit fussy to grow, but in practice if you are in an area with low rainfall and reasonable sunshine hours you should be successful. A specific issue with Cox is "Cox spot", a rust-like physiological disorder inherent to this variety, which can be mild or non-existent in some seasons and quite severe (causing early leaf fall) in others. The cause is unknown and there is no treatment, but fortunately although it is unsightly it does not seem to affect the fruit. Growers in wetter areas might want to consider Fiesta or Sunset, which are closely related and have similar flavour but tolerate higher rainfall much better. Cox's Orange Pippin is somewhat unusual because it is available in both self-fertile and self-sterile forms - most of ours are the self-fertile form. In general we recommend that you try to have a nearby pollination partner as this will improve cropping. 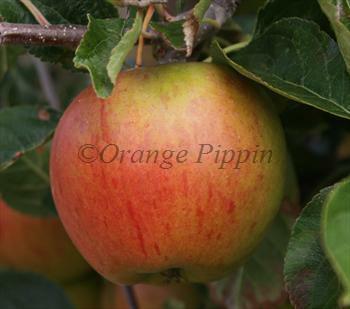 Cox's Orange Pippin was raised by Richard Cox, in Buckinghamshire, England, in the early 19th century. The parentage is unknown but it is possibly a seedling of Ribston Pippin. Over time it became apparent that some Cox trees had a good degree of self-fertility but it was not until the 1970s that a standardised self-fertile form was established by the Long Ashton research station near Bristol. This is now the recommended form. Almost since it was first discovered, Cox's Orange Pippin has featured in the development of new apple varieties, as breeders sought to marry its excellent aromatic flavours with other varieties which might be heavier cropping or have more versatile climate characteristics. Many of these have become excellent varieties in their own right. Cox enthusiasts are likely to find Rubinette and Queen Cox of particular interest, as these two varieties arguably both match Cox for their outstanding flavours, and maybe even exceed it.